Everybody loves a triple, right. Well I guess vegetarians don’t partake in the gorging of a triple cheeseburger much, but anyone from America knows what I’m talking about. Especially if your name is Kirstie Alley. 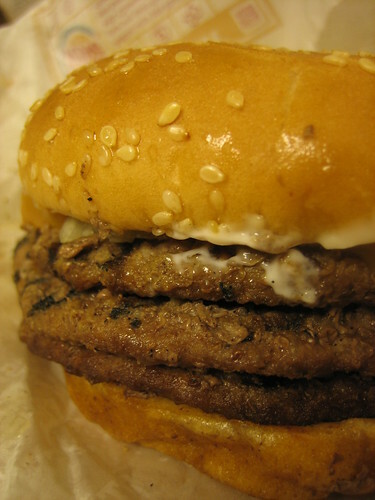 But the truth is that the most tasty triple-decker in the world is being resurrected in Italy. Yes the same country that has the Leaning Tower of Pizza also could be home to the most delicious triple-decker in all of the land. What’s that it’s the Leaning Tower of Pisa. Isn’t Pisa Italian for pizza anyway? But enough about food. Let’s move onto football. Inter Milan might be the owners of the tasty treat if they can pull off two final Cup victories and also seal the league title with three victories. That means they are ony five matches away from pulling off the triple. Not too shabby Mr. Mourinho. In fact only two teams really stand in their way of achieving such a John Candy-esque feat. The two squads are Roma and Bayern Munich. In fact you can count Roma double time because the side trails Inter by two points in league play and also will face the powerhouse in May in the Coppa Italia final. So Roma could achieve the double or just end up in trouble. But the real match to look for is obviously that Champions League final against Bayern Munich. The Germans have been underestimated throughout the tournament and now find themselves in the final match. Mourinho has proven the critics wrong and the German brats might be the only thing that stands in the way of a delicous triple decker. And that is pretty tasty combination anyway you break it down.